After all these years of teaching, you would think that I wouldn’t be so nervous about being observed. All day, I couldn’t help, but feel anxious and excited as I awaited the time of my observation. This was the first time I was being formally observed for an entire lesson at my new school. I had a lot planned for the 45 minute session. I would be doing an entire reading workshop, which included a mini-lesson, independent reading and share time. I was excited to have my principal come in because I honestly enjoy getting the feedback afterwards. When I was teaching in NYC, I had a phenomenal principal who always gave me really good and constructive feedback. He really challenged me to improve my teaching craft through his feedback and high expectations for learning at all times. I was excited to have my new principal see my reading workshop as I’ve been working on improving a few areas like small group conferences and keeping better notes of conferences through my IPAD app confer. I totally recommend it if you have an IPAD! The lesson overall went smoothly as I felt my timing was good and I was able to get through 3 small group conferences in a 30 minute independent reading session. I was able to keep my mini-lesson at 10 minutes and also get through the share at the end. It’s not easy getting all that packed into a short 45 minute session, but I felt a sense of relief and accomplishment at the end. What a funny observation from a student! He/she was right, I love how they observe life. I’m glad your lesson went well and hopefully you will get feedback soon. It’s always nerve-wracking to have someone in there to watch when they may not be aware of the nuances of the class. Well, your student had it right! Thanks for sharing!! What always helped me was telling students that the principal was there to see what amazing things they were doing. This instilled in them a sense of pride and gave us a teamwork spirit–in the best of times. Your post reminded me that I need to bulk up on my share time during readers’ workshop. So glad your observation went well! We are informally observed once each week- a “walk-through”- by our principal and vice principal. I teasingly asked why it seems like they come in at inopportune moments. For the past week, I’ve been visited at least 3 times a day. “Just checking if this is a good time,” he says. What you’ve written here is so true….the anxiety and excitement leading up to the observation but then receiving great feedback after! I too love the feedback part! I’m you and your lab-rats *smile* survived! Congrats! It took me a long time to feel that my door was open to anyone and everyone,anytime! Sounds like you had a great lesson. 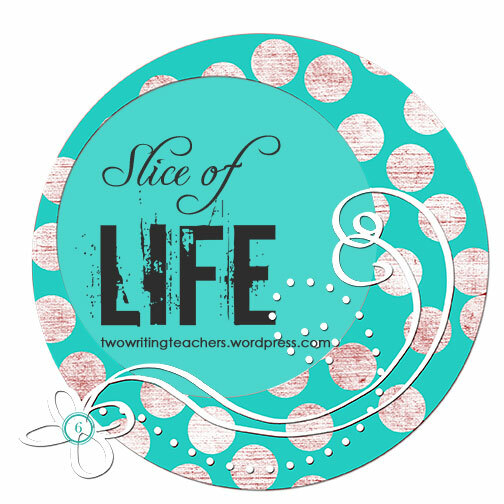 And student slices to read as your reflect. Perfect! Love your student’s analogy! Funny how we are so nervous being observed, but the students felt like they were also under the microscope too. Love your openness to the observations as well — that’s what they should be about: conversations to improve! Way to go! I’m sure you were awesome! I think it’s tricky when evaluations and observations are the same things… when everything is summative and little is formative. It feels like getting graded only on your big standardized test when you’ve done beautiful portfolios of work each and every day. I’ve totally felt like that before…but it sounds like you had a great observation! Good work!